With summer vacation over and winter vacation months away, it might seem like the family fun has been put on pause. But the weather outside is cool and crisp and New York fall foliage is simply spectacular—so don’t sit this season out! An affordable weekender is all you need to enjoy the weather, nature, and each other. Read on for 10 amazing trips that each can fit into a weekend and won’t break the bank! 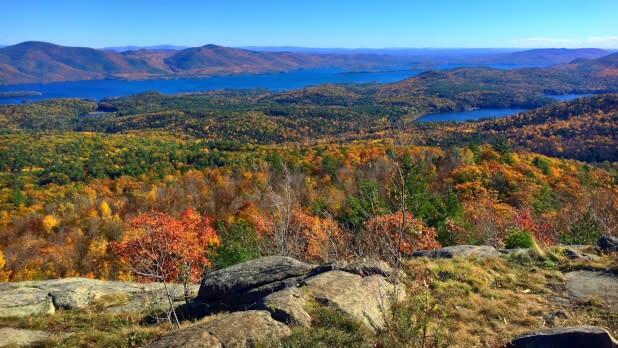 Lake George offers up some prime leaf-peeping beginning the last weekend of September. Consider booking rooms at the Heritage of Lake George Motel where the rooms are cozy and comfortable and only a short walking distance from a bunch of nearby things to do in town. Another option is the gorgeous Courtyard Lake George where you can book rooms with stunning views of the Lake. Pop over into the village where you can explore the reconstructed 263-year-old Fort William Henry Museum and Restoration (adults $17, kids 5–15 $8). Actors will bring to life the local military history from the French and Indian War, including interactions with Native Americans and the role women played in supporting the army. With all that history comes a rich collection of ghost stories, which is why, until the end of October, every Wednesday through Sunday night at 7:30, 8, 9, and 9:30 you can sign up to take a ghost tour of the old fort (adults $18, kids 5–15 $8), illuminated only by candlelight! With baseball season coming, the very fun, baseball-centric Cooperstown starts to get less crowded, so you have more space to enjoy it. It also means more rooms are available to book at places like the Best Western Cooperstown Inn & Suites, just four and a half miles from the National Baseball Hall of Fame & Museum (adults $23, kids 7–12 $12). While the HoF is sheer heaven for baseball fans, it does a great job of making the significance and history of the sport interesting and accessible even for non-fans, and they offer scavenger hunts for little kids! Be sure to take the four-minute drive from downtown to check out the Farmer’s Museum (adults $12, kids 7–12 $6), one of the oldest rural life museums in the country. 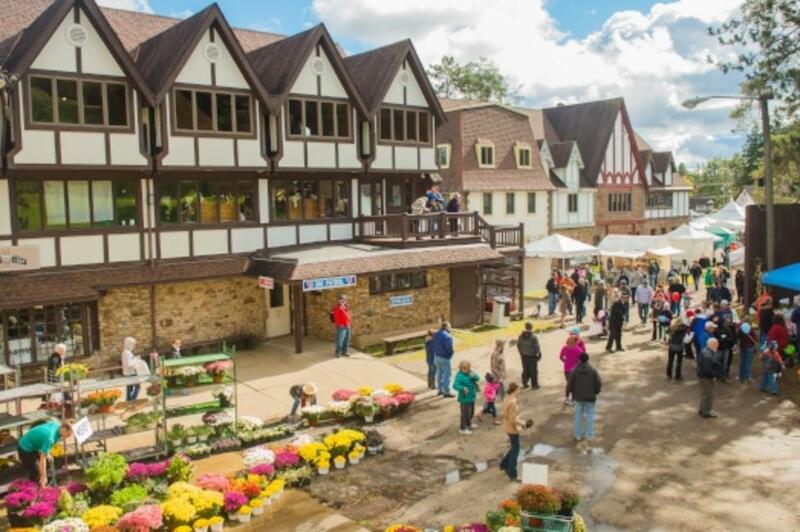 We’re willing to bet that anyone who thinks history is boring has never experienced it come to life like it does here, thanks to the recreated village, costumed period actors, livestock, craft demonstrations, and workshops. A bunch of the exhibits are interactive, so you can get hands-on with setting type in the print shop, hammering out a nail ring in the blacksmith’s shop, making rope, or clapping and stomping your feet along to live music in the tavern. And since some of the best perks of autumn are fresh, crispy apples, perfectly tart apple cider, and piping hot apple cider donuts—find all of them at Fly Creek Cider Mill. 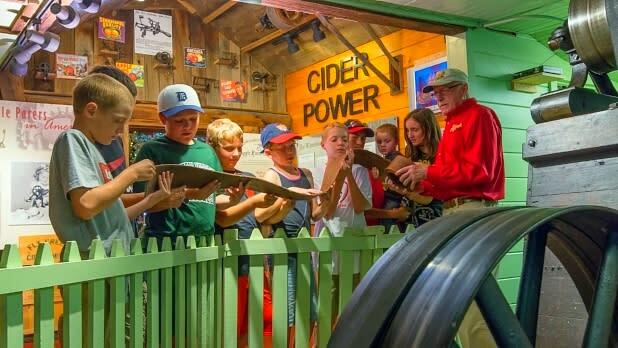 This 160-year-old water-powered cider mill offers tours that let you see how the cider is pressed. Follow that with a stop in the Snack Barn & Bakery where you can sample specialty foods and dig into fresh apple pie. Best Western Cooperstown Inn & Suites double bed units starting at $118. Not all resorts cost an arm and a leg! The Peek n’ Peak Resort in Chautauqua offers family packages that including a stay in its lodge-style inn, pool passes for four people plus a large pizza, soft drinks, ice cream, and a family s’mores kit (aka, all the ingredients of an amazing time), all for around $150/night. Plus, the resort has a ton of fun activities right on site, including its luxury pool complex, play zone center, and its Mountain Adventures ropes course. The Explorer Pass grants you access to the ropes, giant dual ziplines, a soaring eagle zipline, mini golf, frisbee golf and more for $49–59—or pay by individual activity, a ride on the soaring eagle zipline, for example, is only $10 a pop. Step outside the resort and there are a ton of amazing and affordable attractions nearby. You must stop by the National Comedy Center (ticket prices range from $12.50–23.50), less than an hour away in Jamestown, where you can laugh until it hurts at more than 50 interactive exhibits dedicated to the art of comedy. It’s totally interactive, as you can create your own cartoons and try something called stand-up karaoke—performing classic routines from some of the greatest comics in history. Only a 20-minute drive will bring you to Panama Rocks Scenic Park (adults $7.50, kids 6–12 $5, kids 5 and under free), where the gang can explore 60-foot-high crevices, hidden caves, and passageways. It’s incredibly gorgeous, and will bring out the explorer in you! New York’s natural beauty becomes even more magical in the fall, and Watkins Glen offers the perfect vantage point. Stay at one of the rustic and charming motel rooms, cabins, or A-frame chalets at Seneca Lodge which serves up dinner and breakfast seven days a week. 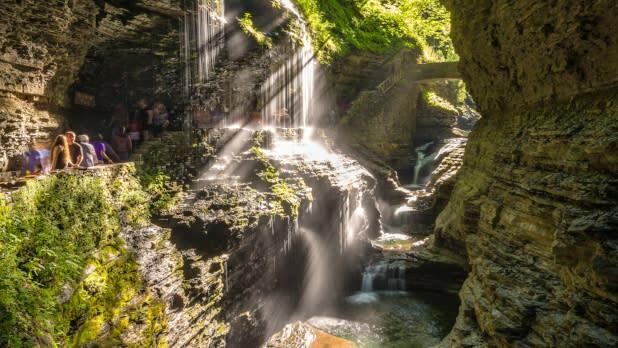 With the Lodge as your home base, you are right at the edge of the incredible Watkins Glen State Park. The park’s trails will guide you past cliffs and a total of 19 individual waterfalls, sometimes even having you walk underneath them! Picnic tables and pavilions are available for a lunch break. Just a 25-minute drive away is the Corning Museum of Glass (adults $19.50, kids 18 and under free) where you’ll find incredible sculptures, live glassmaking demonstrations, and even the chance to try glassmaking yourself. From September 4 through November 30, you can make your very own glass pumpkin, as well as check out the all-glass Thanksgiving feast display while the museum cafe serves hot cider, pumpkin pie, caramel apples, and more. 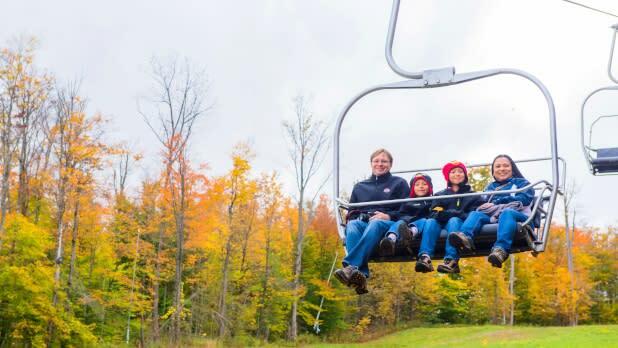 Drive one hour northeast to Bristol Mountain for the most jaw-dropping views of Finger Lakes foliage from their Sky Rides, a 15–20 minute ski-lift trip (adults $10, kids 3–12 $7). Seneca Lodge cabins range from $60–$110 per night, 3-bedroom A-frames range from $160–$180 per night, motel rooms range from $80–$105 per night. 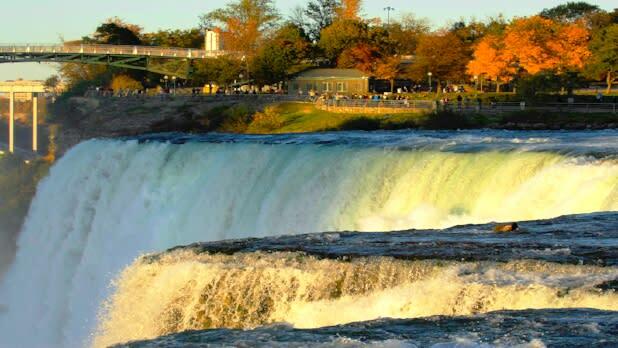 There really is no bad season to take the family out to see one of the country’s greatest natural wonders but there are a bunch of reasons why fall is so great at Niagara Falls. First of all, it’s not as crowded as it is during summer, nor is it too cold to get close to the action. Take a Maid of the Mist boat tour (adults $19.25, kids 6–12 $11.20), running until November 4, which takes you right up to the falls—don’t worry, they provide the ponchos! Cave of the Winds tours (adults $12, kids $9) run until October 21, and bring you down 175 feet by elevator to a “Hurricane Deck” within spraying distance of the Bridal Veil Falls. An amazing rainy day plan—or just a terrific can’t-miss stop—is the Aquarium of Niagara (adults $14.95, kids 3–12 $10.95), where the price of general admission includes penguin-feedings, Sea Lion Shows, and talks with experts throughout the day. Settle in for the night at the Holiday Inn Niagara Falls-Scenic Downtown for affordable room rates in the heart of the city. From there, Becker Farms is less than an hour drive away. Besides an out-of-this-world farm bakery, they’ve got fantastic U-pick selections of more than 10 different kinds of apples. Double bed units starting at $167.68 at Holiday Inn Niagara Falls-Scenic Downtown. Becker Farms U-Pick $5.50, includes access to the apple orchard and a 4-quart bag of apples. In the Venn diagram of affordable + fun getaways, outdoor camping is smack dab in the middle, so don’t let the cool autumn weather slip away without one memorable weekend in the great outdoors. 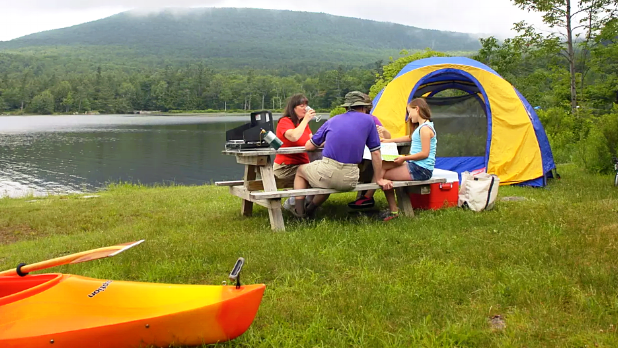 North-South Lake Campground is an ideal spot to pitch the family tent, with two lakes with beaches, two picnic areas with pavilions for rent, plenty of tables, fireplaces, and charcoal grills, a playground for the kids, as well as flush toilets, hot showers(! ), kayak and paddle boat rentals, and a trailer dump station. Plus, you’re perfectly located right at the entrance to great and easy hiking trails that lead to some beautiful vistas, like the two-tiered 260-foot Kaaterskill Falls. Take a break from your hectic day-to-day and slow things down at a bed and breakfast in the country. Country and Farm B&B in the Hudson Valley lets you experience farm life along with clean, cozy rooms and a breakfast of fresh fruit, croissants, muffins, yogurt, and juice delivered right to your door. They have their own horses who will be very pleased to meet you and your little ones, along with a few dogs (feel free to bring your pup for an overnight stay for only $10 extra a night! ), chickens, bunnies, and more. 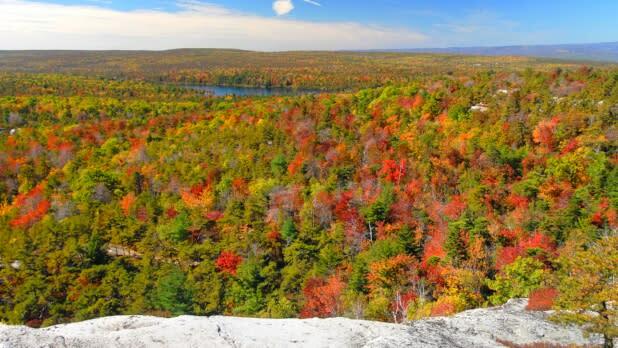 It’s also right next to the lovely Minnewaska State Park which has plenty of hiking trails for all levels. We know it’s sad to say goodbye to beach season but luckily Long Island is still an amazing place to spend the weekend even if it’s too nippy to dip your toes in the ocean. We know that Long Island lodging can get pricey, but don’t panic. The Ramada Plaza by Wyndham Holtsville Long Island has super reasonable rooms and puts you about a 25-minute drive from plenty of fun family spots over on the North Fork. Goodale Farms, for example, lets you stop in and feed their adorable goats, and Harbes Family Orchard lets you ride a tractor-pulled wagon (the Apple Express) to go pick your own bushel of apples, wander their corn maze, or sign up to try their “Spooky Maze” by flashlight on Friday and Saturday nights during the month of October. 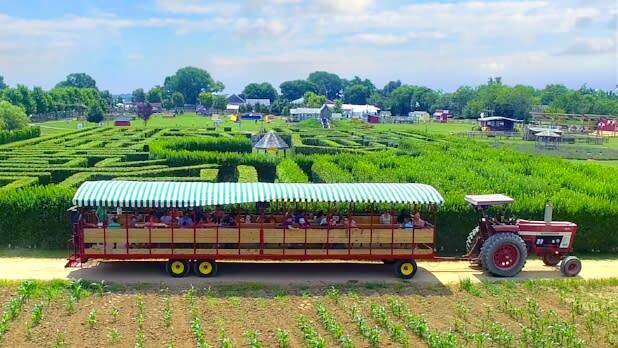 You can also check out their Barnyard Adventure (prices range from $9.95–$13.95) for their gnome-themed hedge maze, barnyard animal petting zoo, Jumbo Jumpers bounce pillows, motorized tricycle rides, chick observatory, and more. We know, we know, New York City is not known for being super affordable, but we swear it’s doable! First of all, the Howard Johnson by Wyndham Long Island City has lovely rooms at reasonable rates and is centrally located so you can easily reach all boroughs. From there, you can take the F train to 42nd and Bryant Park then walk to 42nd and Times Square to take the 2 train up to the Bronx Zoo (adults $36.95, kids 3–12 $26.95). 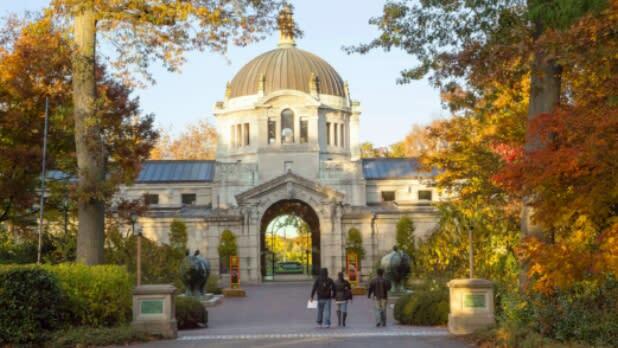 Every weekend in October, plus Columbus Day, they put on “Boo at the Zoo,” a series of family-friendly Halloween activities, including magic shows, costume parades, a maze, pumpkin carving, live music, a haunted forest, animal encounters, and more. New York’s capital city has got it all: tasty treats, perfect parks, and reasonable rates. Post up at the Hampton Inn & Suites Albany - Downtown for nice rooms at nice prices in the heart of the city. From there, start exploring the city with Dutch Apple Cruise & Tour’s narrated Hudson River Sightseeing Cruise (adults $19.95, kids 3-10 $12) to learn all about the city’s history and points of interest, and enjoy an all-around fun ride. Next up, the Albany Pine Bush Preserve is absolutely gorgeous this time of year. Walk the trails on your own or take a guided tour with a naturalist. Their Discovery Center has tons of hands-on activities, like making your own sand dune and touching snakeskin. Mountain Ridge Adventure is only a 30-minute drive away and offers a fantastic kids’ ropes course adventure for only $29.99. That’s three hours to climb, leap, balance, and zip line surrounded by the beauty of the forest treetops. 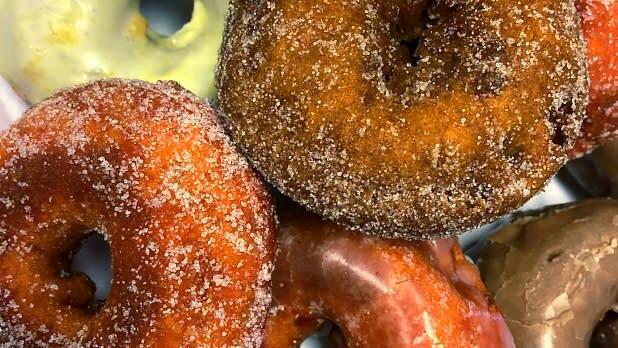 Finally, consider Cider Belly a must-stop while you’re in the city because these donuts are famous—we’re talking, “If you could only eat one cider donut, it should be this donut”-good. Double bedroom rates starting at $165.